In the immediate aftermath of the May 3 terror attack in Texas, the media response, not surprisingly, was to blame the organizers of the “Draw Muhammad” contest for the violence. Chris Matthews of MSNBC nailed down the left wing of the reaction when he said, “I think [Pamela Geller] caused this trouble.” Yet the response of most so-called “conservatives” was not all that different — more tactful, more nuanced, perhaps, but essentially the same: “If it weren’t for the hatred promoted by people like Robert Spencer, Pamela Geller, and Geert Wilders, this tragic violence would never have occurred.” The rarity of dissent from the elite consensus on what happened in Garland made strange bedfellows out of left- and right-leaning pundits such as Bill Maher and Sean Hannity. Conservatives who were fond of quoting Voltaire made themselves scarce during the controversy. All right, so I said, “I disagree with what you say, but I will defend to the death your right to say it.” But fer cryin’ out loud, that doesn’t apply to Islamophobia! So what happened? All those people who were proud to link up arms and carry “Je suis Charlie Hebdo” signs in candlelight vigils back in January — where did they go? 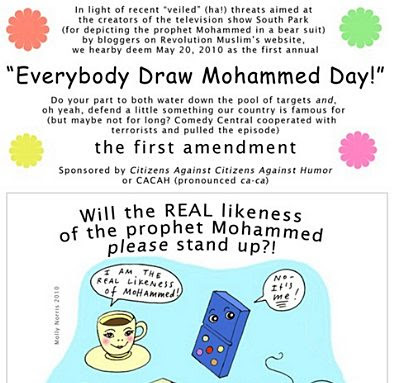 A large part of the aversion reaction to the Draw Muhammad contest can be attributed to the organizers’ reputation as “right-wing extremists”. The Charlie Hebdo editors and cartoonists may have been “Islamophobes”, but they were reliably left-wing, and politically correct in all their other opinions. Pamela Geller and Robert Spencer, on the other hand, are already known as right-wingers, which puts them beyond the pale. And Geert Wilders has long been identified as a “neo-fascist” in this country, even by ostensible conservatives. So a certain level of shunning is to be expected. This explains some of the reaction to the attack in Garland. But not all of it. Many alleged conservatives — including Bill O’Reilly, Laura Ingraham, Donald Trump, and numerous others — have joined the chorus against Pamela Geller. A plumbing of the depths of the zeitgeist is warranted. 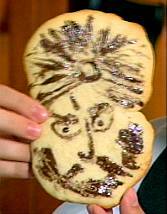 The following analysis of the likely causes of the reactions to Garland is entirely subjective. Since Dymphna and I don’t own a TV, my assessment of our cultural miasma is based on the ebb and flow of Internet-based information. A caveat: conspiracy theories are to be avoided as plausible explanations for what’s going on. It may be that the course of events has been manipulated by a few hundred or a couple of thousand devilishly clever and well-concealed puppet-masters who pull the strings of all our politicians and media people. But that’s not a useful line of enquiry. Not only is it an unfalsifiable proposition — any lack of evidence for it being proof of the diabolical genius of the conspirators at hiding their machinations — but it also flies in the face of my personal experience of ordinary people, who after all make up the bulk of the participants in these events. So you’re welcome to your theories about the role of the Protocols of the Trilateral Elders of Bohemian Grove; just don’t air them here. One of the basic premises for this analysis is that the vast majority of the players are people of mostly good intentions. They want to do the right thing, but also try to make a profit, or improve their status in the eyes of their colleagues, or maintain their privileges and perks. Or some combination of these things, all while avoiding being killed by the Religion of Peace. Yes, it’s possible that such people are being manipulated by devious politicians and banksters who direct the course of events from their eyries in the strongholds of the New World Order. But I’m more interested in guessing the motives of these foot-soldiers who actuate all the schemes of the movers and shakers. There are four general categories of possible motivation. Functioning together and separately, they account for the intense and broad-based reaction against Pamela Geller and the Texas Motoons. 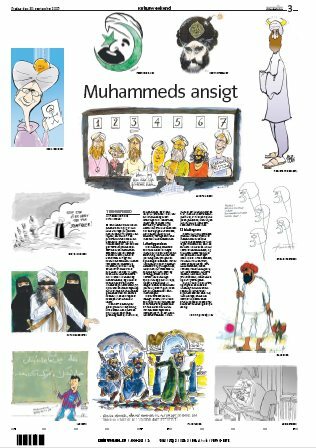 The original Danish Mohammed cartoon crisis of 2005-2006, the prototype for all subsequent cartoon crises, was the indirect result of fear. Even before the Western zeitgeist had coalesced into pre-emptive self-censorship, there was a reluctance among Western artists to depict Mohammed. 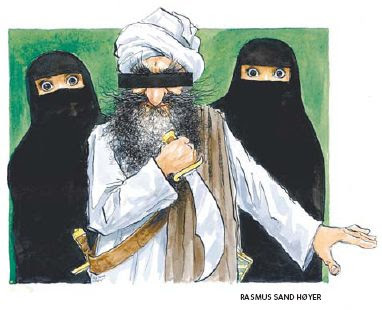 This was what Flemming Rose, the culture editor of Jyllands-Posten, discovered when he commissioned various artists to draw Mohammed cartoons: only twelve were willing to contribute. There was already a general understanding of the inherent risks, at least in Denmark. The ensuing fury of the “Muslim street” was enough to instill fear in the hearts of artists and editors. 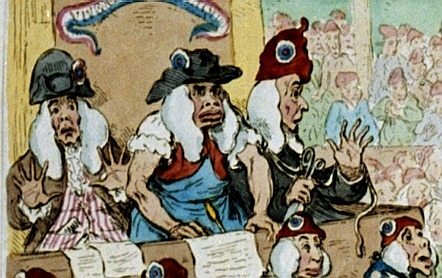 Any cartoonist of significant public stature — that is, any whose work would likely generate noticeable publicity — could be reasonably expected to eschew the drawing of Motoons. Only the most fearless — or in the case of Molly Norris, the most clueless — dared to violate the Mo-taboo. 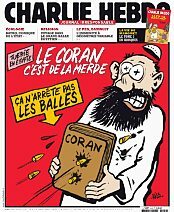 Lars Vilks, Charlie Hebdo, and most recently Bosch Fawstin have knowingly and courageously entered the Islamic firing range with their various works of art. The Charlie Hebdo cartoonists paid with their lives for insulting the prophet, and Messrs. Vilks and Fawstin would have met the same fate if the mujahideen had succeeded in their assassination attempts. 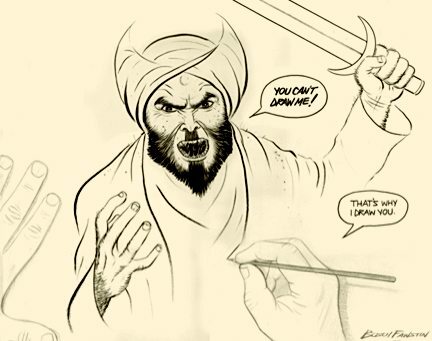 Fear is an understandable motivation for not drawing Mohammed cartoons, and for disapproving of them when they appear. But it really only applies to the artists and editors themselves. Talking heads on TV shows and op-ed writers in the papers are unlikely to be targeted for simply supporting the right of artists to draw Mohammed. Commentators really don’t have to worry — so why join in the chorus of condemnation? And, if the whole thing makes them a little nervous, why don’t they just remain silent and sit this one out? Why the public expression of outrage against Pamela Geller? One possible explanation is something I call institutional fear. Although a pundit may not experience personal fear, there is a general fear percolating through his media milieu, radiating outwards from the artists, writers, and editors who would be on the front line as potential targets if they ever dared to criticize or ridicule Islam. In addition, managers of media companies may be justifiably concerned that their corporate offices will be firebombed. A culture of fear develops within the media industry, infecting even non-combatant pundits, who thus feel compelled speak out and repudiate all insults against Islam in hope of protecting themselves and their fellows from the ire of the Hosts of Mohammed. Institutional fear can also be generated by fiscal considerations. A media outlet has to consider the possibility of lost revenue if advertisers withdraw, or if Muslims and their leftist allies boycott the parent company. Administrators may face an increase in insurance premiums, or find themselves completely unable to insure certain events. Retail outlets may refuse to carry certain books, magazines, DVDs, etc. All of these consequences impact the bottom line, so that even if an executive has no personal fear, his fiduciary responsibility to his shareholders may require him to choose the “cowardly” path. Personal fear and institutional fear may combine and spread to permeate an entire industry with fear derivatives. 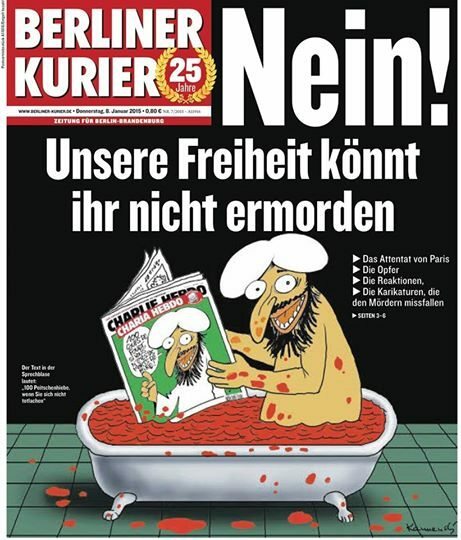 After a while, it becomes simply unthinkable in most of the media industry to criticize Islam or make jokes about it. Consciously or unconsciously, fear derivatives inform the decisions of most media personnel, ensuring that they buy into dominant memes such as “A Tiny Minority of Extremists”, “Hijacked a Noble Religion”, “Nothing to do with Islam”, and all the other fairy tales peddled by the suave Muslim Brotherhood operatives who appear on television and speak at public events. This widespread culture of unacknowledged fear is closely related to the next causative factor. The social status of the average professional is determined by two metrics: his monetary rewards (or other material gains), and the esteem in which he is held by his fellow humans. The latter consideration may include the regard of his professional colleagues, the applause of his audience, his evaluation by some sort of ratings agency, and various other means by which his place in society is affirmed. Taken together, these signals inform him of his status and ranking as a member of his profession. To be held in low esteem by the group — or worse yet, to be ostracized — is to be avoided at all costs. To ensure the safety of his position as a member in good standing, the insecure media professional will tend to say the same general things that most of his fellows are saying. By the time the fear derivatives trickle down to him, the possibility of being slaughtered by Islam may no longer be the foremost issue. The important thing is simply to confirm his position in the middle of the herd by denouncing the “demonization of an entire religion” and repudiating “those who promote hatred”. In the case of the Draw Muhammad contest, the rush to join the herd was accelerated by the “right-wing extremist” label that was already affixed to the organizers of the event. No one has a worse case of the Screaming Nazi Heeber-Jeebers than a centrist conservative with a prime-time TV slot; hence the alacrity with which people like Bill O’Reilly joined their more leftist brethren in pronouncing anathema against Pamela Geller. By such means one’s position in the center of the herd is assured. One of the defining characteristics of the media herd is the perceived imperative for tolerance. In its original manifestation, the impulse is a commendable one, rooted in the Golden Rule and the common religious traditions of Western Civilization. As tolerance loses its connection with its cultural roots, however, it metastasizes into a more toxic form. El Inglés labeled this phenomenon “deranged altruism”: tolerance taken to such irrational extremes that it becomes self-destructive and suicidal. Brave is sitting down calmly on a plane behind a row of suspicious-looking Arabs, ignoring your own fears, because you know those fears are irrational, and because even if there’s a chance that they are terrorists, it is more important to you to preserve an open and tolerant society than to survive this trip. Brave is insisting that Arabs not be searched more carefully in airport security than anyone else, because you believe that it is more important not to discriminate against people based on their race than to keep the occasional terrorist from getting on a plane. It would be a shame — as great a tragedy as this was — it would be a shame if our diversity became a casualty as well. In a similar vein, a young Frenchman who was badly beaten by four “youths” on a Paris bus could stand as a model for Millennials all across the West. After a CCTV video of the attack made the young fellow famous overnight, he gave an interview in which he said that his attackers were not racists, and the incident had nothing to do with immigration. Furthermore, he deplored the fact that “extremists” were circulating the video. He did not want the incident to be exploited by “racist” whites to promote bigotry and intolerance. The toxic tolerance on display in France becomes that much worse when it reaches this side of the Atlantic, due to Americans’ deep-seated ideals about religious freedom. Islam is a religion; therefore Muslims must be free to practice it; therefore we must tolerate what they do. If we have to turn a blind eye to all the evidence for what Islam is really all about, then so be it — tolerance requires it. I felt the same way about Islam until 1981, when I read Among the Believers: An Islamic Journey by V.S. Naipaul. The book permanently changed my perspective on Islam, and I realized that a civilizational war must eventually come. Prior to that, however, I saw Muslims the way I saw Hindus, Sikhs and Buddhists. They wore their exotic clothes, and they worshipped in buildings with strange inscriptions on the outside. Otherwise they were essentially the same as we were, and wasn’t America a wonderful place, that it could accommodate such diverse religious beliefs! I suspect that the majority of Americans still believe something like this. If you haven’t been paying much attention, and take the TV’s word on the “nothing to do with Islam” meme, then your innate sense of tolerance and fair play requires you to allow Muslims into your town, to provide them with footbaths and halal food at school, to affirmatively not discriminate against them in any way, and to rationalize away all instances of bad behavior. Something similar is at work among the media types. They’re Americans (most of them), and tolerance of other religions is mandatory for them. Anyone who maligns or mocks another religion is execrable from that standpoint, and must be denounced. Hence the knee-jerk vitriol aimed at Pamela Geller. It must be hard for them to grasp the fact that Islam is primarily a political ideology, and a totalitarian one at that. And in any case, if you were to point it out to them, they would be loath to listen, because you’re not being nice, and everyone must at all costs be nice. Christianity is still vital in the United States, but not among media people. Most of the talking heads and pundits are atheists, agnostics, or non-observant adherents of whatever faith they come from. The deracinated version of Christian ethics that they practice has lost its scriptural and theological basis. What remains is the Golden Rule, the notion of a general tolerance towards others, and a requirement not to be offensive to others. They have either never encountered the Gospels, or failed to study them more than superficially. They don’t realize that being nice wasn’t high on the list of Christ’s goals. They don’t know that much of what Jesus did and said was deeply offensive to a substantial number of his listeners — to the extent that they screamed to crucify him when given the chance. One can only see “niceness” as mandatory for Christians if one has largely abandoned Christianity. Which is exactly what has happened to our chattering classes — the deep spiritual well that fed us for centuries has dried up for them, leaving only a damp silt of niceness over their ethical concepts. This may explain most of the aversive reaction to the Draw Muhammad contest in Garland. Above all else, Pamela Geller was not playing nice. And, to add a dollop of subliminal racism to that outrage, she was being mean to brown people (since Muslims are all honorary browns, regardless of their genetic heritage). She was being a racist meanie where niceness was absolutely mandatory. Therefore she had to be shown the error of her ways. And, yes, the implication was that if the terrorists had succeeded in bumping her off, in a way she would have deserved it. Because she wasn’t being nice. The question remains: why did some conservative media people stand by Pamela Geller, Robert Spencer, Bosch Fawstin, and all the other brave people who put together the Draw Muhammad event? What made Mark Steyn, Megyn Kelly, and Sean Hannity different? Why were they willing to buck the herd consensus and stand with the Motoonists on principle? What made them decide not to be nice? I don’t have the answers to those questions. I don’t really know anything about the religious faith of the dissenters, so I can’t tell whether there was a spiritual component to their resistance. But the fact that they were so few in number is discouraging. It tells us how far gone we are, and how hard it will be to resist the eventual Islamization of the United States of America. The opinion-makers among the intelligentsia don’t have sufficient spiritual resources to mount a meaningful defense of their own heritage. We’re fortunate that there were a handful of people willing to say “I believe in free speech” without adding the “BUT…” clause. But the vast majority of pundits did add that “but”. The clause that follows the “but” is the one that will eventually rule over us. By then the part about “free speech” will have been forgotten. 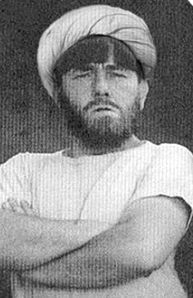 Hat tip for the Bjørn Stærk quote: Fjordman. This entry was posted in Civil Liberties, Counterjihad, Culture Wars, Domestic terrorism, Europe, Media, PC/MC, Religion, USA by Baron Bodissey. Bookmark the permalink. I doubt V.S. Naipaul would be permitted to write that book today. What publisher would be willing to take the pressure and pushback? I’ve never understood why his travels through Muslim lands and his reportage of those travels didn’t earn the man a great big fatwa. We got a used replacement copy a few years back. Must have been while the Baron could still read. Or maybe not; but I read it again and came away with the same view as before: that Islam is a dead-end world view because of its inherent fatalism. Don’t struggle too hard because nothing, absolutely NOTHING, happens without happens without Allah’s say-so. As I said then, no wonder there is no curiosity, no joie de vivre, no real intellectual ‘pull’ toward good literature or music. Islam is relentlessly mechanistic; there’s not a shred of being summoned to listen to “the angels of our better nature” in any polity ruled by shariah. Islam is unutterably sad. V.S. Naipaul captured that sadness and despair. No wonder death looks good when you live under such a mortal burden. The real reason for jihad is, that islam makes it easy to die but absolutely impossible to live. There are very good reasons why islamic politics are often compared with communism and nazism. Like them, islam is basically a deathcult, celebrating all that destroys life. Tolerating it, is a lot like tolerating the plague. Sure, you can do that, but why would you? I spent two years in the Gulf, it survives only because oil wealth buys the toys for the boys to play with and stay occupied, the women are not important. The leaders are not ‘muslim’ but inflict Islam on their people in a feudal type relationship. Those leaders live behind very high walls where the hoi-polloi don’t get a look in. There are many tales of what goes on behind those walls, and none of them are nice. Many young males drive like maniacs, if Allah is controlling their destiny then he decides if they have an accident or not so it does not matter. There is also a very defined and rigid hierarchy, also defined by Allah, each person has their place, in tribe and clan, and should not even dream of deviating from it. Within one’s station, one is then free to be ambitious, and the resulting politicking is ruinous. The food in Riyadh good though. Academic researchers I know now doubt if Mohammed even existed. People are being killed and desocialised for drawing and criticising a man that was not alive in the first place. My own investigations into the Archaeology and Theology indeed seem to confirm this fact. This is something which the liberal elite are now using to comfort themselves. Show that Mohammed is a fiction, and muslims will stop taking him and islam seriously: civilisational conflict over. As if muslims are going to be influenced by the despised kafirs denigrating the foundation of islam. 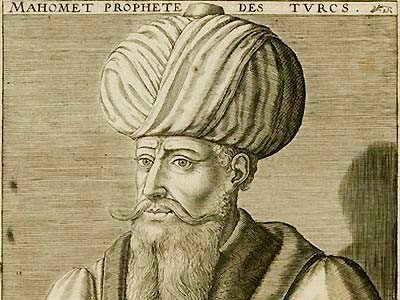 Robert Spencer came to the conclusion that Muhammad was a figure of legend and not history. Would you characterize Robert as a member of the liberal elite? I would not. Curisously enough, I happen to think that Mohammed is probably a figure of fiction. I’m not a member of the elite. I was saying that elite seem to be drawn to this claim precisely because it comforts them that they need do nothing to oppose islamisation but talk up this idea. When Tom Holland did his TV programme articulating this idea, he was not allowed to make the argument, without having a muslim academic present to show why muslims should ignore it. My leftwing friends in the UK still claim that muslims are no more fundamentalist now than they were 30 years ago. This despite the suicide bombings in the last 15 years, despite the massive prevalence now of women in burkas on the streets of our cities, despite gay being forced out of east London, and despite surveys which show they are more fundamentalist and surveys which show the younger generation of muslims are 3x as fundamentalist as their parents generation. The Left will hold on to all manner of delusions, rather than face the coming civil war, which they enabled. It is impossible to get even “moderate muslims” or “reformist muslims” to criticise the character of Mohammed. Yet the elite are far more interested in talking about the non-existence of Mohammed than they are about educating the public about the demographics, the history of violent subjugation by muslims, etc. Hello you two. I hope all’s well. Baron, great essay, and definitely a Watcher’s pick this week and to be linked at my place shortly. I’ll have to see if I can find Naipaul’s book around somewhere. I think you’re on to something very potent here, and if you read the history of some Islamic conquests that occurred in stages like Iran,the strategy of instilling institutional fear is an old one. Fortunately, it also works in reverse if applied. As far as some of the people who have come out against Pam Geller, Geert Wilders and R0bert Spencer a point to consider is that aside from wanting to ‘be nice’ there are also relationships in the mix. Bill O’Reilly was the first person to put Laura Ingraham on TV regularly, and even to let her sub for him on occasion. He’s helped her career significantly, and his show is one of the most popular on cable news. There may be a certain amount of parroting going on. OTOH, Megyn Kelly and Sean Hannity are quite well established, and so are Rush Limbaugh and Mark Levin, while Mark Steyn is fairly independent these days, having pretty much split with NRO over his court case. It could be they simply feel freer than O’Reilly and others to voice their views. Or indeed it could be a matter of courage. Well – I beg to differ in one quite fundamental principle I feel is permeating this article: one statement for all: “Most of the talking heads and pundits are atheists, agnostics, or non-observant adherents of whatever faith they come from”. I am an atheist and agree with Pamela and Robert – for one simple reason: they are providing an erudite analysis of Islam, its history, ambitions and future trends. They are simply educated and scholarly consistent. They are Churchillian voices of awakening from the PC lethargy. I think the lack of *real* dissent in the media – left to right – is just our cowardice, hand in hand with money already vested. Sadly, the current development eerily reminds me of 1930s in Europe – the ensuing world war, Holocaust and so-close-win of fascism were just logical consequences of appeasement. I’ve been staggered, time and time again, from the Viet Nam War on, at the absolutely tiny understanding most Americans (U.S. citizens right on up to and including the President, no matter who he is) have of the world, its history, and its behavior. Heck, it’s hard enough for these Americans to understand the factors that might make someone in “usually wet and becoming overrun with Californians” Oregon vote differently from someone in “used to be wet and now very dry and losing population” Kansas. So there’s that lack of international or even interstate understanding. The media and, of course, our Congress reps at both levels are–yep–Americans. So is the President (pick one: Kennedy, Johnson, Nixon for Viet Nam; Carter, Reagan, Bush I, Clinton, Bush II, Obama). Precious few of them have actually *studied* and/or even *paid attention* to cultural and religious goings-on in the world, to develop a deeper knowledge of history than your average bear. It’s not only depicting the “prophet” Mohammad in magazines etc that the mainstream avoid like the plague – it also extends to TV and the film industry. No fictional character in any TV show or any movie is ever called Mohammad. Even when the show/movie has Muslim characters ( and Mohammad is by far the most common Muslim name) there are never any Mohammads to be seen. Way too risky! It’s not just the “no depicting of Mohammed”. There is a denial, across the board, by academics and journalists concerning past depictions of Mohammed. For example, whenever the violence/free-speech issue comes up around this, none of them comment about all those images of Mohammed found historically. Significantly, back in 1977 event the TinTin comics could do an explanation for kids of the violent rise of islam, using a front-cover drawing of Mohammed leading his murderers to attack some victims. See the archive here: http://www.zombietime.com/mohammed_image_archive/ The TinTin cover is found under the “book illustrations”. When Fregosi was commissioned to write his history Jihad in the West, note that it wasn’t an academic historian writing this book. Fregosi’s book was published 3 years before 9/11, but still his commissioning publisher backed out, because of death threats from muslims. So often I hear people say “you can’t say that”. We can be sure that the same thing is said between academics these last 50 years, when it comes to telling the truth about islam. Political correctness has now taken hold in universities, dating back at least to the early 1990s. In 10 years time, the last generation to escape this mental straight-jacket will have retired. Who needs a conspiracy on details, after 50 years of self-censorship. Must we all become as dumb as ……… our leaders and elites? As cowardly, craven, foolish, corrupt and vain? Must we substitute delusion and lies for truth and honesty as our leaders and elites do? Must the next generation suffer from the immorality of our lack of courage at this time in history? For give me if this doesn’t seem to be on topic. After reading this post, I was swept up emotionally, with a sense of bleakness and betrayal! Hard to argue with a single line of this lucid and eloquent analysis. .
One question: that portrait of Mohammed towards the top appears to be from an earlier time, so could it be that at one time it was no crime (sorry for rhyme, I couldn’t resist) to draw Mohammed? Can anyone enlighten me? I will return later to see if anyone has responded to the question. The Baron says: it’s French, from (he thinks) the 17th century. No one killed people for drawing Mo in those days. Turkish and Persian versions of the Sira were sometimes illustrated with depictions of Mohammed. The prohibition of depictions is more a phenomenon of the Hijaz, a Bedouin thing. It was only imposed on the rest of the world with the dominance of Bedouin oil. See my link to the Zombietime archive. Thank god someone compiled those images. Amazon UK describes “Among the Believers” as “controversial” but lists it new and used, for as little as a penny. Criticizing and satirizing Islamists, I’m afraid, is the least we are going to have to do. We can’t allow our children’s childrens’ future etc., for thousands of years, to be poisoned by this malignant, no love, no humor, no fun, hateful, depressive ideological garbage. So we have to attack and go to war. This means being offensive. Descriptions of Mohammad by his followers note that he had a deep cleft in his kisser from being struck in the face by an enemy’s sword, so he should be depicted looking like an amoeba about to divide if at all. Well, so Ben Hur said when put in a pinch between loyalty to a misguided old friend and his sense of honor. Of course we defend free speech, but…that’s a double edged sword, isn’t it? If we refuse to acknowledge that people (Muslims or not) have a right to protest against the public display of images they find insulting, then let’s just toss the whole idea that we’re defending “free” speech and admit that we only care about protecting denigration of Islam. I’ve said this before, but we have to draw a line and distinguish between what is “speech” and what is not, or we end up allowing the murder of offensive cartoonists because such murders are a form of ‘expression’, and free expression is our highest ideals, right? Wrong. Free speech means speech, and that means that murders aren’t covered. But then we have to negotiate the question of whether cartoons are speech…and it isn’t a slam dunk. But talking heads saying that cartoons aren’t protected speech…clearly is protected speech. I’m not saying that we ought to permit Sharia murders as a form of free expression, nor that we should completely discard the notions that cartoons can be a form of speech or press. My real point is that both sides are mostly taking stupid positions because “for or against me” apparently excludes “offering helpful advice”. The other side is going to be stupid, and there isn’t a lot I can do about that…partly because I don’t even want to help those who are arguing that Koranic Islamists should be given a free hand. If they’re going to be complete fools, then the only thing preferable would be if they woke up and completely stopped being fools about Islam. But I do have an investment in helping the CounterJihad develop the best and most logically sound arguments to defend Western Civilization. And that means rejecting this idiot dichotomy of pretending that there is only one side of the issue when the issue is free speech…or really ANY kind of freedom. Your assessment of your own strategic and tactical acumen may or may not be accurate. But if I were you, I wouldn’t write off the Motoon strategies just yet. You deprecate the cartoonists and the shows, but the latest gig in Texas had an unexpected impact on the culture at large. It created widening ripples that have yet to abate. The situation we find ourselves in today is unprecedented. It’s unwise to rule out any given strategy if it shows at least some signs of effectiveness, because we don’t actually know what may eventually work — we’ve never seen the like of these times before. They are a tactic…and unless they are incorporated into a broader and intelligently composed strategy, they are doomed to failure. Contra Forrest Gump and other such popular fictions, one cannot simply “stumble to victory”. Motoons are funny. I like things that are funny. Therefore I like Motoons. I also like balloons. That doesn’t make balloons or Motoons an effective means of defending Western Civilization. That’s not a condemnation of Motoons any more than it’s a condemnation of balloons…but if I see people marching off to attempt to defend the West armed with nothing but balloons, then I would be just as fervent in declaring that it was a bad idea. There are things we can do with our freedom which really don’t contribute to defending our freedom. The whole point of freedom is that we’re allowed to do things other than just defend freedom…but that doesn’t change the fact that not everything we can do with freedom actually do anything to defend freedom. Your assertion that “Motoons aren’t a strategy” assumes information that you aren’t privy to. Geert Wilders has not confided in you. You don’t actually know that his initiatives involving Motoons are not part of a larger strategic plan. It’s possible that he has realized their strategic utility in ways you haven’t thought of. One of the greatest risks for people of extremely high intelligence is the tendency towards arrogance. When they are always far more intelligent than those around them, exceptionally bright people become accustomed to having the most effective solutions and most accurate judgments of anyone they know. With almost no peers to provide meaningful feedback, they operate in an information vacuum that they may not even be aware of. If they are not careful, and do not maintain a sufficient level of self-examination, they may unconsciously begin to assume that their evaluations of the situation are always correct, and that their judgment is infallible. Eventually reality will reveal the nature of their errors, but by then, of course, the consequences of their misjudgments may be devastating. The most prudent course is to move beyond mere intelligence and aim for wisdom. Our Savior advised us to be as wise as serpents and innocent as doves. One facet of wisdom is the understanding that those who are less intelligent than we are may come up with better solutions than we do, through a sudden flash of insight, or patient, humble persistence, of by a stroke of luck (or the intervention of the Holy Spirit, if you prefer). To assume that we know those lesser minds are wrong when final outcomes have not yet revealed themselves is to make a serious error, possibly a fatal one. As I mentioned earlier, the situation we find ourselves in is entirely unprecedented. We are now embedded in a system of instantaneous global communication, and in the midst of a global economic bubble whose collapse is mathematically inevitable. Such conditions have never occurred before in history. Therefore no one, no matter how brilliant, can credibly claim to know what is going to happen, and which strategies will in fact work. We are in uncharted territory. We are foot-soldiers in an information war the likes of which have never before been seen. Islam has up until now proved far more shrewd and effective than we are in fighting this war. However, the best strategic minds in the West are only just beginning to come online and mount a counterattack against the Hosts of Mohammed. We’re still in early innings. To assert that the strategies that others have devised won’t work, or that they are not even strategies, is to run the risk of arrogance, which will inevitably lead to serious errors, some of which may be fatal. Ummm…we’re not privy to what Geert Wilders’ strategies are either, though we can look at what he supports tactically and take an educated guess. Yes, among the three of us – and others in our comment community – I would say that the IQ level is above average and additionally, it tends to make us all arrogant at times. Doesn’t seem a good strategy on our part to single out Chui for criticism in an area where most of us are lacking. I’ve been looking at this comment for a few hours now and it makes me uncomfortable. Yes, Baron, I know what we do – as Steve Coughlin said – is a thankless job, but if we take others to task for intellectual “arrogance” I think we’re also in that spotlight sometimes too. Perhaps me more than you, since I tend to be reactive. Well, I think I’ll let your response stand. Of course, from my perspective, the CounterJihad is only one part (albeit a rather important one) of the larger defense of Western Civilization. So I do sometimes focus on other things for a while. But the pervasive connections between all the enemies of the West means that I’ll usually be back eventually. In truth, the problem for me isn’t so much that I don’t see Motoons as a viable tactic in specific circumstances but rather that a clear and precedented counter exists and could be applied in many of the situations which people have argued for using Motoons. I never like to rely on a plan that depends on the enemy not doing something I already know they could do, especially because they’ve done it in the past. Of course, sometimes you don’t have a lot of options other than to bluff and hope nobody calls it. But that kind of game is the epitome of “the only winning move is not to play.” Not because you’ll lose every time or even most the time…but because you’re likeliest to lose when you can least afford it. Doesn’t ridicule work? I bet apostates/hour were higher after Motoons. We are trying to create apostates. These are created when folks feel they are riding the wrong horse. Being-made-fools-of does this. Thank you for the explanation. I do appreciate it. Of the three reasons for succumbing to Islamic demands I would say that #1 is the most prominent. When no one in North America’s MSM would republish the Danish cartoons I believe it was out of fear. I would not be at all surprised to learn that editors held meetings and determined that their buildings and their employees would be at risk if they did publish the cartoons. As a mask, they used tolerance… Which has been quite helpful in the following years to avoid fear. One cannot help but think that all other publishers in North America took notice of this and decided that fear of death, or at least financial ruin, awaited them if they published anything derogatory about Islam . Fear is a tremendous motivating factor. It is much better to claim “niceness” or “tolerance” then just plain saying you are scared to death to do something that really, must be done but will put your life on the line. 5. Dislike of the messenger. She is spot on in her opinions and perspective on Islam but Pamela Geller can be so intense in her delivery of the message that it instigates resistance. There is a point at which such boldness becomes a virtue rather than a drawback. Usually, that point is when you realize that there is no longer any point in trying to negotiate with the opposing view. I’ve felt that way about terrorists basically since I knew what the term meant. Especially Islamists. Perhaps when writing this the author, Bjorn Staerk, was unaware of what an airline employee subsequently wrote about his checking in of a First Class passenger at Bangor, Maine in the small hours of the morning on September 11, 2001. Looking at the somewhat nervous, lightly perspiring, man of Arab appearance, the check-in clerk had this thought: “If this guy doesn’t look exactly like an Arab terrorist looks, then nobody does” [verbatim]. Then his PC indoctrination kicked in: “How prejudiced of me? How could I even think that?” So he boarded Mohammed Atta onto the plane without further ado. And a few hours later his man piloted a jet-airliner into one of World Trade Center towers, killing thousands. Now imagine if the Bangor airport clerk had instead followed his first thought – usually the best one where people are concerned – and ignored his self-doubting PC second thoughts. Apart from the compelling need to replace “Brave” with “Foolish”, let us examine the above ‘Creed of the deluded suicidal idiot’. Whilst the plane passenger’s fears about the suspicious looking Arabs are contended to be known to be irrational, he nonetheless goes on to examine a scenario where there might be a chance that they ARE terrorists. (Pal, if you know your thoughts are “irrational”, then that’s the end of it. Perhaps you don’t understand the meaning of the word “irrational”: it is irrational of me to believe that an elephant is going to fall out of the sky and crush me as I cross the road: it is not irrational to believe a distracted motorist might run me over.) How can it be “more important to you to preserve an open and tolerant society than survive this trip”? If you don’t survive the trip that means you won’t be around to enjoy your society. And how exactly is the preservation of an open and tolerant society significantly diminished by the profiling of airline passengers based on their Arab/Islamic names and/or appearances? This is just assumed to be the case. One could argue that it is in the best interests of preserving an open and tolerant society that airport security actually do so. It would be a minor inconvenience to those so profiled and there would be vast benefits at the other end of the equation. So its more important not to discriminate against someone based on their race than keep the occasional terrorist from getting on a plane? Even if that discrimination does not involve denying that person a home, a job, a promotion, entry to a restaurant, hotel, bar, school, hospital, library, personal liberty or the ability to travel? Just a few minutes extra delay in getting on a plane? Bjorn, I hope you don’t have children now and never have any: your genes, your values and your thought processes should not be passed on.